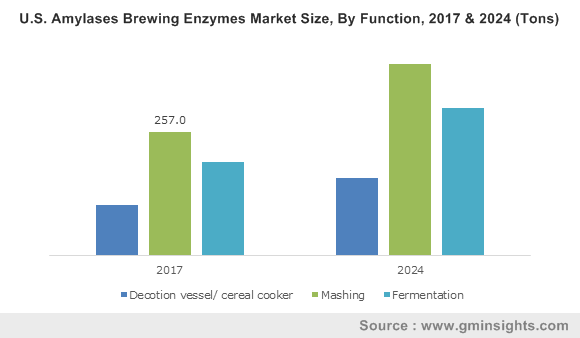 Brewing Enzymes Market size was worth over USD 240 Million in 2017 and will surpass 17 kilo tons by 2024. Necessity to optimize production to meet the rising beer demand is propel the brewing enzymes market growth. Requirement improved beer quality & better flavour will augment the product demand. Focus of beer producers on improving the economic feasibility owing to rising count of breweries globally will supplement the industry growth. Strategic R&D spending on by enzyme manufacturers on product development focussing on improving the product efficiency will boost the business revenue during the forecast timeframe from 2018 to 2024. Additionally, improved beer stability is strongly supporting the volume sales. According to industry sources, the global beer production was 190.91 billion liters in 2017. China is the major beer producer contributing approximately 21% of the total beer production. Growing count of active breweries is surging the business development. For instance, as per industry reports, the number of active breweries in European Union have grown from 5,086 in 2012 to 8,490 in 2016. Growing demand for craft beer supported by rising number of craft breweries is fuelling the brewing enzymes industry growth. For instance, according to the Brewers Association, the count of craft breweries in Europe have grown substantially from 2,420 in 2012 to 6,266 in 2017. Rising count of microbreweries and necessity to compete with large manufacturers through cost reduction is surging the brewing enzymes business revenue. For instance, microbreweries in UK grew from 778 in 2010 to 2,198 in 2016. Extensive product launches in alcohol-free and low-alcohol segment owing to trend towards healthy lifestyle is fuelling the market expansion. MEA and Europe witness higher demand for the non-alcoholic beer. Europe accounts for over 30% of the non-alcoholic beer market share. Need to improve the cost efficiency and taste consistency of beer is expanding the brewing enzymes business development. Stimulating demand for gluten-free and flavoured beer coupled with penetration of globally renowned companies in low-alcohol & alcohol-free segments will prompt the demand over the next few years. Increasing consumer spending on food & beverages particularly in developing nations will support the beer industry demand. Rapid urbanization accompanied by rising demand for alcoholic beverages through dining restaurants, cafes, bars & pubs will positively influence the market development. However, brewing enzymes work efficiently in a limited range near optimum temperature & pH. Additionally, fluctuating raw material prices can hamper the industry revenues. Amylases accounted at over 32% of the global brewing enzymes market share in 2017. Wide-ranging functional benefits along with strong outlook in several brewery processes including fermentation, mashing, and cereal cooking is positively influencing the amylases business growth. Stable & uniform mashing coupled with improved filtration are among the key factors driving the product demand. Higher production of fermentable glucose in beer production particularly in light beer is fuelling the industry development. Necessity to expand the beer production capacity with utilization of existing manufacturing facilities is driving the market revenue. The optimal temperature of amylase is higher than other products. Beta-glucanase brewing enzymes is estimated to witness growth at around 6.5% up to 2024. Enhanced wort separation by hydrolysing glucans, improved filtration and reduced viscosity are among the primary factors driving the industry demand globally. The optimal temperature for beta-glucanase is among the lowest at around 45 deg. C.
North America brewing enzymes market will witness growth at over 6.0% from 2018 to 2024. Rising competitiveness in beer industry along with need for improving the economic viability is driving the business growth in the region. For instance, as per Brewers Association, the total U.S. brewery count grew at around 16% in 2017 as compared to the previous year, with around 620 new microbreweries in 2017. Increased beer production in the U.S., owing to presence of key industry players will propel the regional market share. The U.S. beer production was over 220 million hectolitres in 2016. Rising demand for alcoholic beverages particularly from bars & pubs will support the industry growth. 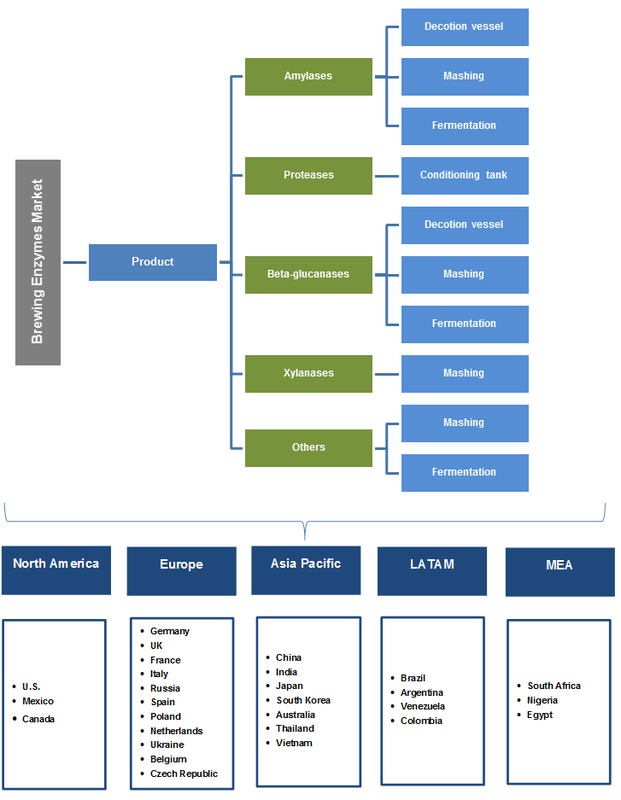 Asia Pacific dominates the brewing enzymes market projected at around USD 130 million in 2024. China, Japan, Vietnam, Thailand, and India are the major beer producing countries in the region. Increasing beer manufacturing plants owing to favourable socio-economic conditions will fuel the industry demand. Urbanization along with growing consumer spending on food & beverages has enhanced the product penetration. Rising demand for low alcohol beer particularly in China and Japan is stimulating the market growth. The global brewing enzymes market share is highly consolidated with large presence of multinational players. The key industry players include Amano, Novozymes, Denykem, Royal DSM, and Danisco. Other prominent players include Megazyme, Dyadic International, Boli Bioproducts, Lyven, Z.A. Biotech, and Aumgene Biosciences. Mergers & acquisitions are among the key strategies implemented by the manufacturers. For instance, in 2016, Novozymes A/S acquired Germany based Organobalance to expand their product portfolio. Major customers include Carlsberg Group, Heineken N.V., Anheuser-Busch InBev, Miller Coors, and Boston Beer Company, Beijing Yanjing Brewery. The global beer market share is fragmented with presence of large number of local & multinational brewers. Asia Pacific and Europe together contribute around 60% to the global production. The beer industry is observing high product launch rate in segments including non-alcoholic & low-alcohol beer, gluten-free beer, and low-calorie beer particularly in Europe, Middle East, and Asia Pacific. Additionally, craft beer is among the fastest growing segments globally. Shifting preference towards flavoured beer will stimulate the brewing enzymes business demand. The global enzymes market is expected to witness a CAGR at around 6.5% for the next few years. Wide scope in applications including food & beverage, bakery, dairy, confectionery is propelling the product development rate. As per industry sources, food & beverage application holds over 35% of the enzymes market share.